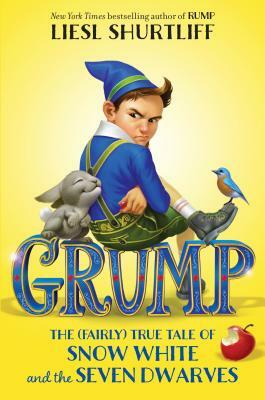 From the New York Times bestselling author of Rump, comes the true story behind another unlikely hero: a grumpy dwarf who gets tangled up in Snow White's feud with the wicked queen. Ever since he was a dwarfling, Borlen (nicknamed "Grump") has dreamed of visiting The Surface, so when opportunity knocks, he leaves his cavern home behind. At first, life aboveground is a dream come true. Queen Elfrieda Veronika Ingrid Lenore (E.V.I.L.) is the best friend Grump always wanted, feeding him all the rubies he can eat and allowing him to rule at her side in exchange for magic and information. But as time goes on, Grump starts to suspect that Queen E.V.I.L. may not be as nice as she seems. . . . When the queen commands him to carry out a horrible task against her stepdaughter Snow White, Grump is in over his head. He's bound by magic to help the queen, but also to protect Snow White. As if that wasn't stressful enough, the queen keeps bugging him for updates through her magic mirror! He'll have to dig deep to find a way out of this pickle, and that's enough to make any dwarf Grumpy indeed. LIESL SHURTLIFF grew up in Salt Lake City, Utah, and just as Snow White had seven dwarves, Liesl had seven siblings to keep her company! Before she became a writer, Liesl graduated from Brigham Young University with a degree in music, dance, and theater. Her first three books, Rump, Jack, and Red are all New York Times bestsellers, and Rump was named to over two dozen state award lists and won an ILA Children's Book Award. She lives in Chicago with her family, where she continues to spin fairy tales.